According to the Department of Energy, insulation in your home provides resistance to heat flow. The more heat flow resistance your insulation provides, the lower your heating and cooling costs. Properly insulating your home not only reduces heating and cooling costs, but also improves comfort. An insulating material’s resistance to conductive heat flow is measured or rated in terms of its thermal resistance or R-value -- the higher the R-value, the greater the insulating effectiveness. 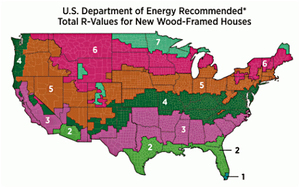 The R-value depends on the type of insulation, its thickness, and its density. When calculating the R-value of a multilayered installation, add the R-values of the individual layers. Installing more insulation in your home increases the R-value and the resistance to heat flow. To determine how much insulation you need for your climate, consult a local insulation contractor. *These recommendations represent cost-effective levels of insulation based on the best available information on local fuel and materials costs and weather conditions. Consequently, the levels may differ from current local building codes. For insulation recommendations tailored to your home, visit the Home Energy Saver tool. Dave Mira is President of D-Wing Construction, serving the greater Tri-Cities area.